A taxi driver is driving through the vibrant streets of Tehran. 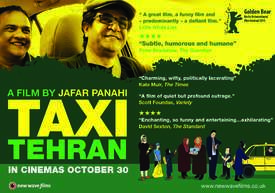 Diverse passengers enter the taxi, each candidly expressing their views while being interviewed by the driver who is no one else but the director Jafar Panahi himself. 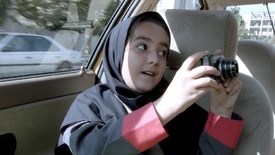 His camera placed on the dashboard of his car, transforms the car into a mobile film studio, and captures the spirit and contradictions of Iranian society through this comedic and dramatic drive. 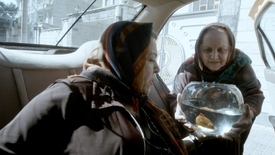 Banned from travelling and making films in 2010, Jafar Panahi has managed to astonish us with his beautiful trilogy composed of This is not a Film (2011), Closed Curtain (2013) and now Taxi, winner of the Golden Bear at this year’s Berlin Film Festival. 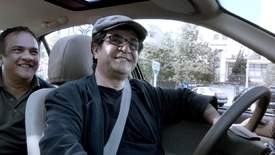 Director, author and producer, Jafar Panahi (b. 1960) is one of the most influential filmmakers in Iran today. He attended film school after serving in the army during the Iran-Iraq War. While making short films and television documentaries, he contacted Abbas Kiarostami to offer his services in any capacity. 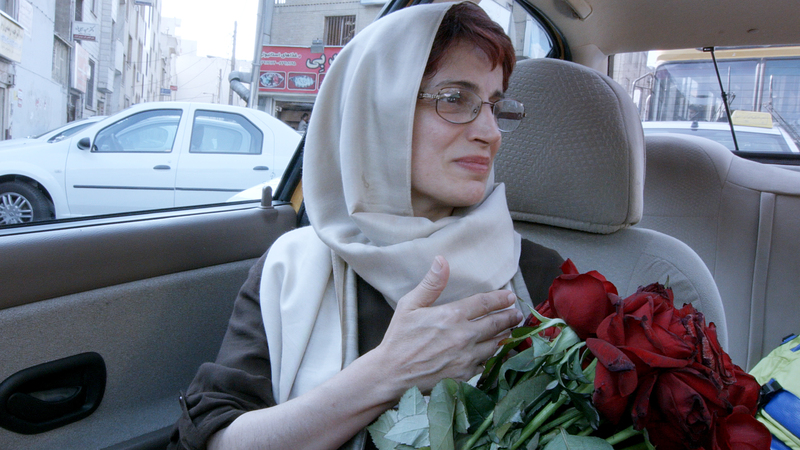 Kiarostami became an enthusiastic mentor, helping to get Panahi’s feature debut, The White Balloon, into Cannes, where it became the first Iranian film to win a major prize, the Camera d’Or (1995). Like many Iranian directors, he began making films about children. The popularity of children as subjects stems in part from the existence of state funding for such films. They also serve to steer filmmakers clear of censorship problems that complicate the filming of any domestic or intimate scenes involving adult women. However, after his first two feature films, Panahi decided to tackle these complications head on by making The Circle, a devastating look at the strictures against women in contemporary Iran. This new tone of social critique continued in the unsettling Crimson Gold. In the aftermath of the 2009 elections, Panahi was detained, sentenced to six years in prison, but then put under house arrest instead with a twenty-year ban on filmmaking, script writing, traveling outside of the country and giving interviews. His sentence of six years in prison still stands, and his past three films were made without authorization. This Is Not A Film (In Film Nist) premiered in Cannes (Special Screening), Closed Curtain (Pardé) won the Silver Bear for Best Script in Berlin, and Tehran Taxi, his latest film, won the Golden Bear in Berlin in 2015. 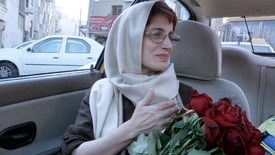 Panahi has won a number of human right prizes, including the Sakharov Prize for Freedom of Thought and The Medal of Art for Freedom. "Reviewing This Is Not a Film in 2012, the great Philip French commented, “There is unlikely to be a wittier, braver, more serious film shown in Britain this year.” Three years on, exactly the same can be said about Panahi’s latest." 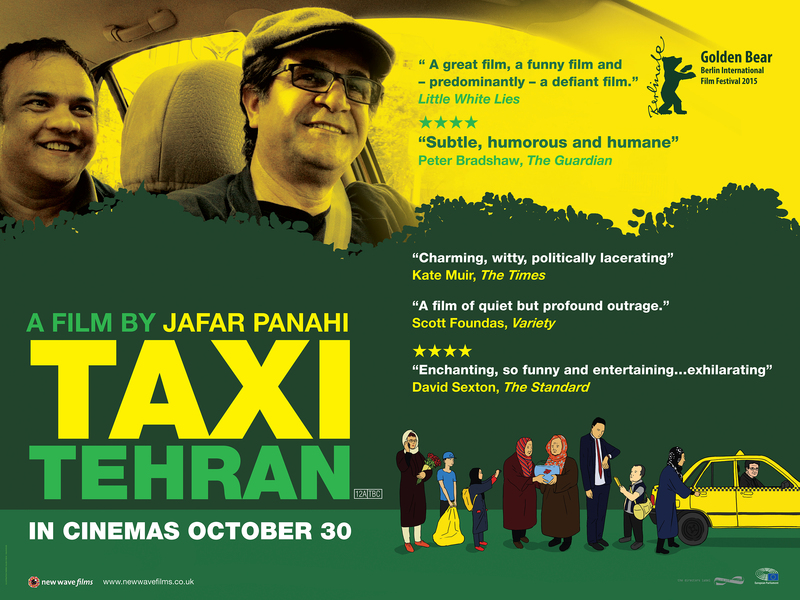 "Jafar Panahi is the Iranian film-maker and democracy campaigner facing official harassment with unique wit, grace and humanity – all apparent in his new movie Taxi Tehran, whose quietly defiant good humour and charm will grow on you, as they grew on me when I first saw it in Berlin earlier this year. It is engaging and disarming: a freewheeling semi-improv piece of guerrilla film-making, cleverly staged and choreographed, with the discursive, digressive qualities of an essay film." "A movie — clandestinely made like its two precursors — of corrosive intelligence and gleaming courage." 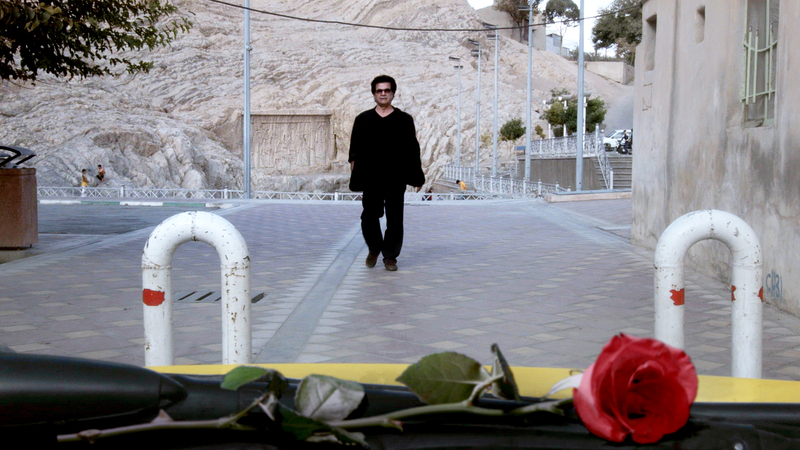 "Reveals Panahi at the top of his game"
"Jafar Panahi’s latest offering is a playful journey through the capital of Iran and Iranian cinema itself"
"A sly, subversive stand in favour of empathy." "With just three tiny cameras, a bunch of roses and no budget, this enchanting film shot in the back of a taxi shows how little you need to make a great movie." "His cheekiest and most playful subversion yet." "This is guerrilla film-making with a difference"
"an intriguing portrait of a city and its people in which there is a good deal of wit and wisdom in the way individuals discuss justice, freedom and the way that technology could be a force for liberation in 21st-century Iran." "A grand panorama of city life, given shape by cruel oppression." 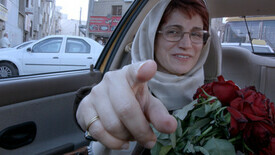 "Oppression has transformed Panahi’s art. Under the pressure of circumstances, he has turned from a classicist into a modernist, while at the same time transforming the very codes and tones of his frame-breaking aesthetic." Taxi is a brilliantly humane testament to the fact that, in the 21st century, cinema is truly everywhere, and Jafar Panahi is still in the driver’s seat. 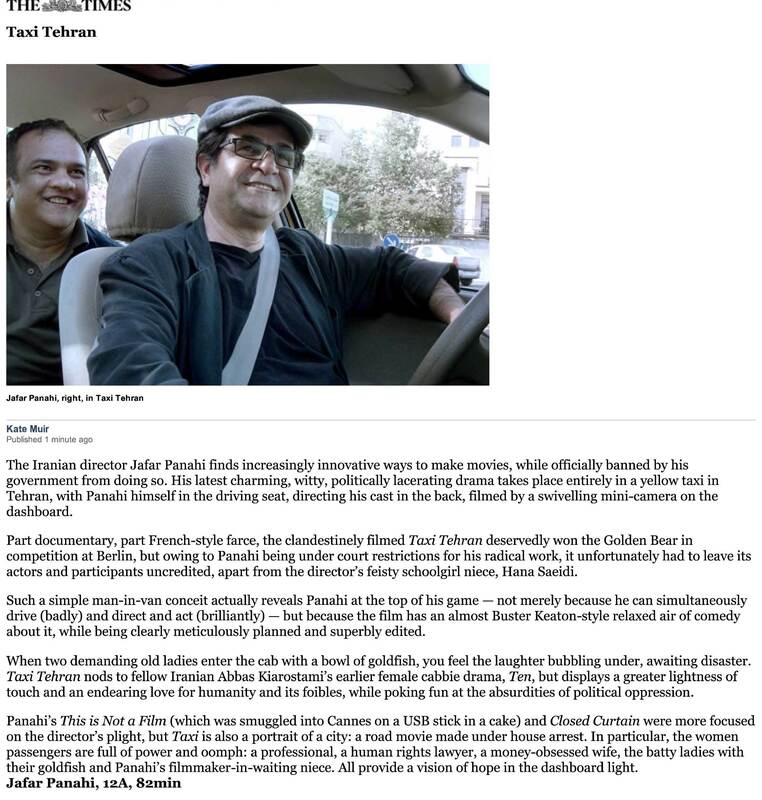 "For the comic gem "Taxi," he adopts a playful mood and the guise of a cabdriver tooling through the streets of Tehran. It's an act of defiance that's also a sublime piece of cinema, and it ranks among the director's finest work."